so yes, without drugs and alcohol, them two couldnt have done what they did. keith says so. eric whines so we feel sorry for him. and made the music they made. mick: "the truth is stranger than fiction and drug therapy both"
Edited 2 time(s). Last edit at 2012-02-27 01:41 by superrevvy. Perhaps Superrevy is too young to have experienced life as a f ckup. Or maybe he feels he has has no responsibilities towards everyone who actually cares about him. I would have admired Keith's book if he'd listed some of the family members and fellow musicians, including Rolling Stones, who had to put up with his "circle" and the constant threat of arrest for everyone around him. Like the children of his bandmates. There's little sense of GROWTH in his book. No sense of humility. Edited 1 time(s). Last edit at 2012-02-27 02:15 by stonesrule. This is simply false; the idea that Eric's years of heroin use made him a rock star is laughable. He spent those years locked up in his house doing heroin and not recording ANYTHING or even being able to perform live. It is well documented. Have you read the book? And his years as a full blown alcoholic coincided almost to a fault with a nadir in his output with some exceptions but that doesn't mean the exceptions were due to alcohol, more like he was able to cut some great tracks IN SPITE of his alcoholism. Its nice romanticize and sometimes drugs, not alcohol, can help creativity along, but there are a bazillion cases where drugs basically took away an artist's creativity. There are of course cases where drug use coincided with an artist's best material but again, take Keith, I'd be hard pressed to argue that his years as a heroin addict where his most creative and saying "they helped me cope with the pressure", if that is what Keith says in his book well that is the cop out and rationalization of an addict! It is a lie and dishonest. Clapton doesn't resort to that, in fact the opposite, which you look down on! My knowledge is limited to Eric's book which is what I have been and am talking about... Clapton's autobiography. I have yet to read about Keith's and am not speaking on that.. I want to be clear about that. Edited 1 time(s). Last edit at 2012-02-27 02:27 by stoned in washington dc. casualties, but cars kill a lot of people too. a "poor excuse for a human being". the problem of course is not drugs and alcohol. it is TOO MUCH drugs and alcohol. substances began to overwhelm the benefits, what did i do? i stopped taking them. genius! of liberation without these medicines, but it certainly can be done. would you rather i whine about how hard it was, or brag about how easy it was? because, believe me, i can do either. with equal veracity. Edited 3 time(s). Last edit at 2012-02-27 02:37 by superrevvy. Listen, I think everyone should do whatever they want, and I do, but you're going from one wild assertion to another. Answer the specific point I made: please tell me how heroin helped Eric Clapton when he ended up spending years of his life locked up in his house doing heroin? anyways, to each his own.. Eric Clapton thinks drugs and alcohol were destructive to his life and documents it pretty exhaustively..superrevvy believes Clapton is a liar unwilling to as he says "man up"... since its Clapton's word against superrevvy's ABOUT CLAPTON'S LIFE I'm going to have to go with Clapton...and thats going to have to do it for me on this topic. eric took too much heroin, so did keith. 2. I thought Keith's book was amazing - laugh-out-loud funny - great stuff. I don't need my authors to "humble themselves." Humility has a place - but not in Keith's autobiography. What exactly would you want Keith to apologize for - giving us great music for a few decades? As far as I'm concerned he was a generous man who has nothing to be contrite about that he hasn't already 'fessed up to...AND FURTHER - I don't think the Stones would have ever made it Keith had NOT been on H for 10 years...mainly 'cause I think 2 HUGE personalites - Mick & Keith - would've split up the band. 3. No matter how "real" an auto-bio is - it's subjective. We all remember things differently and have our own spin. Sh#t, if you asked 2 people to recount the things they did together yesterday, you'll get two different stories. That's the difference between "subjective" and "objective" writing (objective being the "unbiased onlooker" - which is damn hard to do in a book about yourself). And even the most objective journalists have a slant. That's why you "believe" or follow some critics/writers more than others. It's a matter of personal taste. 4. I try not to be negative, but I thought Clapton's book was UNBELIEVABLY BORING. He is humorless. And I like his music...his early stuff was amazing - though I never thought he was "God," I do think he's one hell of a picker. 5. I have GREAT respect for people who rehabbed & come out clean on the other side . But if I want to hear accolades about AA, I'll head to a meeting or pick up a copy of the "Big Book." Memphis - the birthplace of the BLUES. Edited 1 time(s). Last edit at 2012-02-27 03:01 by memphiscats. Edited 1 time(s). Last edit at 2012-02-27 03:01 by superrevvy. To get back to the Howlin for Hubert concert. Some of the moments were spectacular. 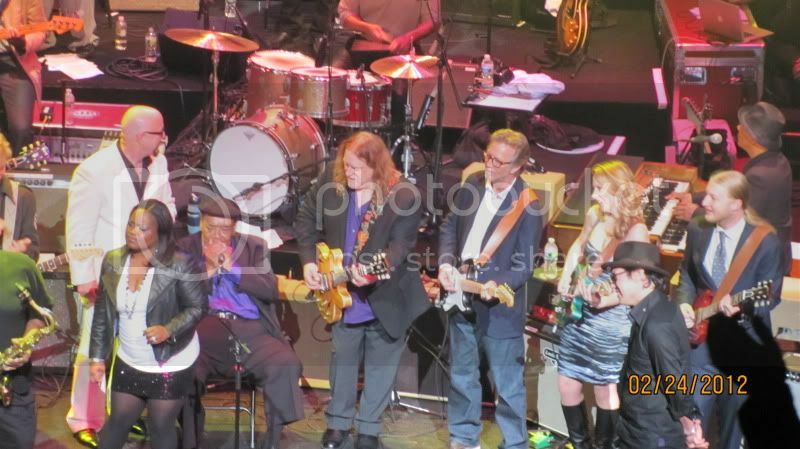 Key to the Highway, with Clapton playing acoustic and James Cotton, was a great start. David Johnansen did a fine job channeling Howlin Wolf. Derek Trucks is always great. It was great to see Keith looking healthy and happy. Many of the musicians sat at the side of the stage (back of stage right), and were visible from the house (at least from upstairs, where I was.) 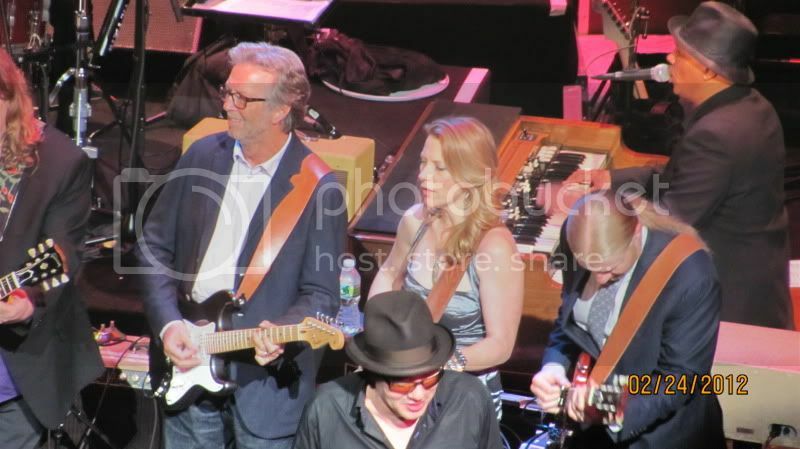 Susan Tedeschi kept getting her picture taken with different folks. At one point, Keith went over and sat there, looking relaxed and enjoying it. After a few minutes, people started shouting "Keith," so he got up and moved. 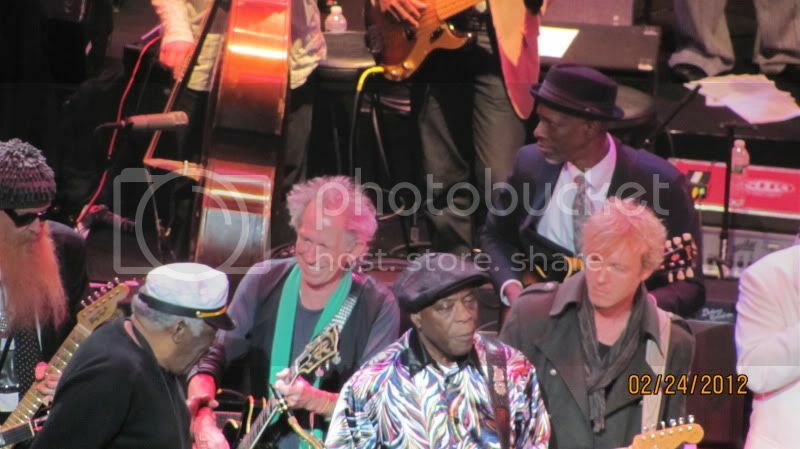 The "best," or most enjoyable guitarist, I thought, was still Buddy Guy. As usual, he was over the top a bit, but he's still spectacularly talented, speaking and singing with that guitar in many different registers, tones, and emotions. When he and Copeland were riffing together, with Copeland begging and Buddy teasing, it was a lot of fun. The best Chicago blues came from Lonnie and Ronnie Baker Brooks. Lonnie lets his son carry the show more now, but they were great and had the crowd going with them. I was disappointed in Clapton's guitar work. I've seen him many times. Usually, when he's with other great players, he turns it up a notch. Sometimes, when he's alone with his band, he just phones it in. Whether it was because he didn't want to be a prima donna, or whatever, he just didn't have it Friday night. As somebody mentioned above, his tone was too clear, and not dirty enough. More importantly, he wasn't playing with soul, his solos were mechanical, and -- except on one song -- they weren't very good. 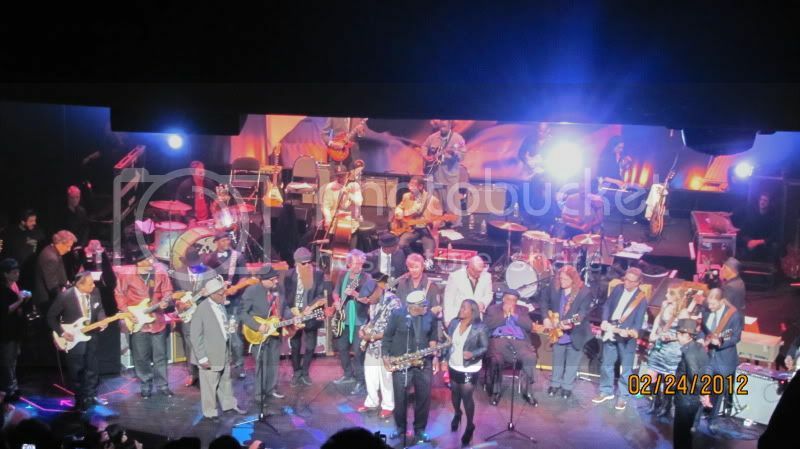 He didn't come across as one of the top 10 electric blues guitar players in the theater -- and that was a surprise. Keith, as I mentioned above, barely played the electric guitar. In the finale, he wasn't playing the lick. 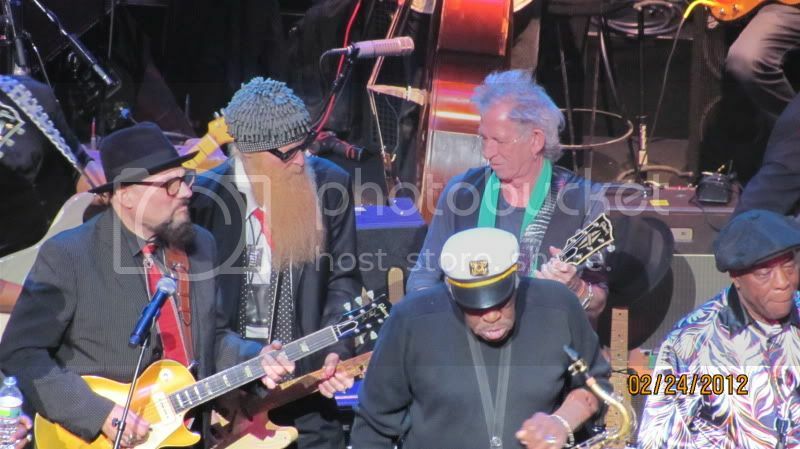 Of the dozen or two guitar players on stage (including the band), he was the only one not playing the lick. It was a wonderful evening. It was great to see Keith there, healthy, singing, and having a good time. But it sure didn't prove that he could play a full concert. Edited 1 time(s). Last edit at 2012-02-27 03:08 by Naturalust. 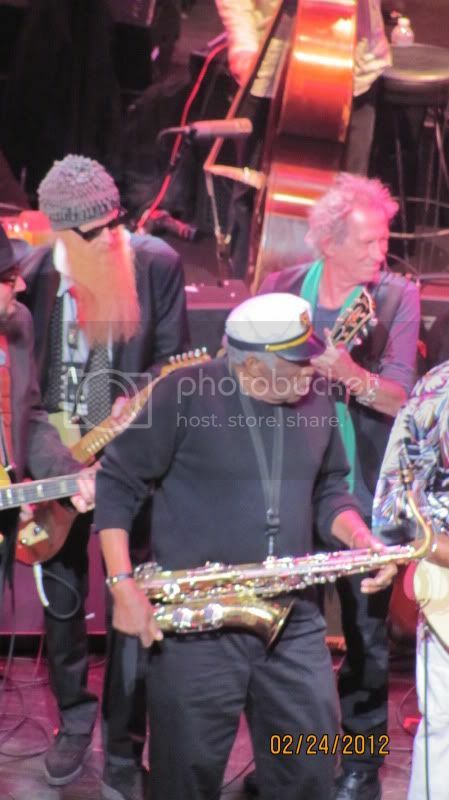 keith's main man willie nelson collaborating with snooop dogg "my medicine"
As a matter of fact, I love Memphis, have been there many times and on one special occasion in Memphis, birthplace of the blues, I introdouced Ronnie Van Zant and the original Lynyrd Skynyrd band to their idol, Eric Clapton. My opinions are based on experience, heartbreak and reality. Each of you has the right to your own opinion. Dude, what are you talking about? I still partake.. I'm still young. But the idea that drugs made these guys is very different from saying they had fun doing drugs! And marijuana is not even a drug in my book...its an herb.. very different from being a junkie! Edited 1 time(s). Last edit at 2012-02-27 04:59 by stoned in washington dc. Looks like the stripped-down back-to-basics Stones fantasy is not doable. Nobody wants another Vegas Stones act. The word on Keth about his playing days being over is spot on. Although there is still a lot of support for Mick's White House performance, I felt great discomfort with the forced prancing and jabbing relative to his age. Mick as the ultimate performing rock star is history. The one positive is that Keith took all of the junk out of his hair. Don't stumble into a tackle box again please Keith. Keith doesn't even look like Kieth anymore and it's been a while. Not his fault of course but I miss the look of the "young" Keith. The pic of Eric Claptom and Keith in that room is almost surreal if you want to pretend that you live in a time warp. What happend to the skinny/faggy rock star look from the 60s and early 70s? lol It looks like two old farts waiting for the checkers tournament to start. Time for our beloved Stones to retire. Edited 2 time(s). Last edit at 2012-02-27 06:27 by little queenie. Little queenie, those are stupendous shots! Thanks so much for sharing! i'm the first one to have a bash at keith if he does or says something ridiculous but i thought this show was pretty damn good. i really liked his voice and the acoustic slide sounded great.it wasnt some big splash and it wasnt supposed to be,just an understated performance that made you actually listen,good job keith. I introdouced Ronnie Van Zant and the original Lynyrd Skynyrd band to their idol, Eric Clapton. Wowzer, that is a feather in the cap for sure and and interesting night I will presume. Maybe your friendship with Slowhand has influenced your opinion of his book somewhat as well? Anyway I hope you will honor us with the story of that meeting in a bit more detail. I would certainly appreciate it. If it was the original LS band that was probaly a time all of those folks were flying pretty high. A generally unhealthy time in the music business if my memory serves me correctly. Heartbreak and lost souls were going Platinum. i was worried about keith during the first number where he was just singing/speaking...but he redeemed himself in the 2nd two numbers and sounded solid. Edited 1 time(s). Last edit at 2012-02-27 10:33 by little queenie. Nothing wrong with Keith here. The LLR-version was good, too. Heartfelt, no flash - just the blues. However, Keith could use a little more distinction between his rhythm sound and his lead sound, imo. Very wise words from memphiscats. WOW, I just watched Goin Down Slow on youtube, and I can tell you, I never thought I'd ever see in my lifetime Keith croon a number (minus guitar) in front of Eric Clapton! Really, has it come to this?! I know you guys don't like me bashing Keith, but does Keith have no pride!? yes LQ really appreciate your pictures from the evening. It was quite a COLORFUL night wasn't it?